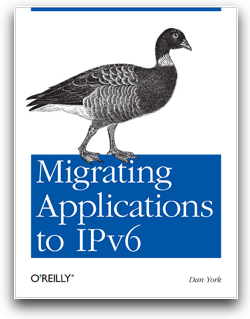 The good folks at O’Reilly have now launched a deal where you can get 50% off of four IPv6-related ebooks, including my Migrating Applications to IPv6 as well as the critical IPv6 Essentials from Silvia Hagan. The deal is only good until April 16, 2012, though! First Update Started To “Migrating Apps to IPv6” – Any Further Feedback? Looking For IPv6 Application Migration Case Studies To Include In The Book – Care To Share Yours? What’s Wrong With This IPv4 Application? Demonstrating IPv6 User Interface Issues – with the web site theme! This server has received 4034670 hits from both ipv4 and ipv6.